AIACA has been working with the small and medium handloom weavers of Varanasi since 2014 to mobilize them into an organized collective, develop business capacities, provide direct market access, develop entrepreneurship and promote authentic handloom brocade weaves. AIACA formed the Varanasi Weavers and Artisans Society (VWAS), also known as Varanasi Weavers Hub, which is a membership based organization of Varanasi handloom weavers and artisans. 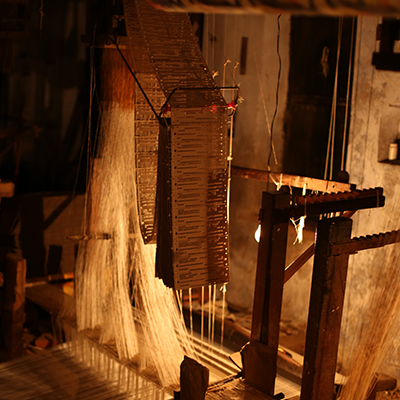 It is an inclusive platform of the weavers and artisans themselves established to promote, continue and preserve authentic handloom weaves and crafts directly sourced from the producers. 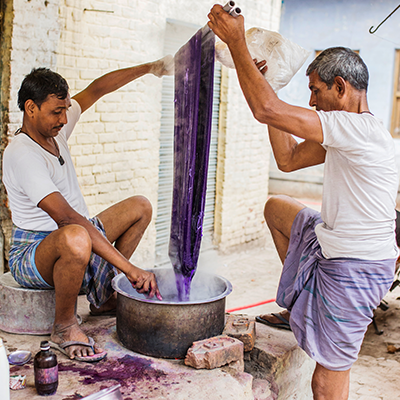 The Hub is certified by Craftmark (a national trademark that certifies genuine Indian handicrafts). The Society takes forward the cause of sustainable livelihood generation and socio – economic empowerment of the actual producers through capacity development, access to fair market share and promotion of the weavers and crafts persons. Additionally, it also ensures supply of genuine handloom weaves and handicrafts produced in a socially and environmentally responsible way for the conscious markets, national and international. The Hub provides a range of business development services to its member weavers including design development and product diversification, business skill development, direct access to markets, technology inputs, access to social welfare schemes, access to finance, etc.